P20079169192	Harlington war memorial. P20079169195	Heading south from Harlington. Description This was my last day walking the Icknield Way, starting off on the Scenic Route before joining the main route eastwards. Weather Today was mostly sunny, with few clouds in the sky. There was not much of a breeze, and all in all it was a good day for a walk. P20079169202	The view north from the Sundon Hills Country Park. P20079169210	The path leading to Sharpenhoe Road. P20079169214	The view from Sharpenhoe Clappers. P20079169227	The Icknield Way heading south to the junction with the historic route. I had only one day's walking to do before the Icknield Way was complete, and it was fairly important that I complete it before we move away from the Cambridge area. Therefore I started driving down the A505 towards the start of the walk, wondering exactly how I was going to do it. Unfortunately travel between Baldock and Harlington is difficult as you have to go into London and change at King's Cross, making it a long and indirect journey. As I approached Baldock I could see that bus services were replacing trains on the section from Baldock to King's Cross, so it seemed sensible to drive to Halington and start from there. This proved to be a mistake and I got slightly lost when trying to find Harlington station, in an area that I have never driven to before. The delay was highly annoying, and pout me in a slightly bad mood by the time I finally managed to park at the station. After buying a ticket and getting my gear into my rucksack I set off, only to be told by another driver that I had left my map on top of my car! Unfortunately this rather inauspicious start to the walk was to continue for the rest of the day, and I really never managed to get my head into the spirit of the walk. Instead of taking the route using footpaths to go through Harlington that I had used on the previous walk I chose to walk along the road, which meant that I got to see the pleasant war memorial and adjacent buildings. It did not take me long to reach the footpath that runs alongside the railway line, and soon the junction with the Icknield Way was reached by a bridge under the railway line. The path was easy to follow as it bordered what appeared to be a tip, and climbed before turning to reach a road, and there were some occasional good views from the higher ground. At a car park the Way started to head eastwards along the top of the ridge, and this was a pleasant stroll with some more good views to the north in places, even when it headed away from the very edge of the escarpment. When it rejoined the top a very narrow path through trees took me onto the road at Sharpenhoe Clappers, and once through another car park the proper route of the Way became harder to find on the ground. I avoided entering an area of trees at the northern end of the hill, and found a sign that took me eastwards. Here things went wrong, as I followed a path steeply downhill that was initially distinct but became rougher as it descended. About halfway up the path ended and I stupidly continued onwards until an impenetrable mass of vegetation by the hedge at the bottom stopped me in my tracks. It was clear much further up that this was not the Way, and I carefully headed back up the slope with some difficulty, pulling myself up using the branches and trunks of the small trees that lined the path. At the top it was not very clear which way to head, and I wandered around until eventually I found a waymarker that showed me the correct route. This made the good views from the hillside bitter-sweet, and I followed a bridleway as it skirted the top of the hillside, running around a couple of little inlets before eventually running alongside the noisy A6(T) and ending by a roundabout. I am unsure whether the bridleway was the 'proper' route of the Icknield Way, but it did its job in getting me to the village of Streatley. It was a relief to be on the road, and I followed this for the short distance to a road junction by a pub that was unfortunately shut. The steep diversion that I had just taken had annoyed me, and the fact that the pub was not yet open increased my bad mood - a state of mind that I rarely get into during walks. A road walk took me out of the village to the A6(T), and then a long walk along a track took me eastwards with power lines above, before another track took me southwards for about half a mile, eventually climbing through trees to rejoin the main route of the Icknield Way on Galley Hill. This meant that I have walked both the historic route of the Way, which passes through Luton and Dunstable, and the scenic route (which I had just completed), and neither are particularly nice. The scenic route had been hard to navigate in places and by the A5 on the previous walk had actually been impassable; these problems should really be sorted before the scenic route takes over from the historic route. It was a relief to be on the 'proper' Icknield Way once more as it headed northeastwards along a firm track, joining a road for a short distance before climbing up Telegraph Hill along one of several parallel tracks. This higher ground was a pleasant diversion even though most of the views were obscured by the surrounding woods, but as the trees ended on the flanks of Deacon Hill I stopped at a gate to chat to a couple who were admiring the views to the northeast. The lady told me that she had been told it was possible to see the spire of Peterborough Cathedral from the spot, something which may be possible, but seems doubtful. It was tempting to go to the trig pillar at the top of Deacon Hill, but there was still a long way to go and so I continued on along the track for the short distance to the B655 road. The Way followed this for a short distance before turning to the left to follow a path along the Bedfordshire / Hertfordshire border past Tingley Wood. A bridleway then took me on into the village of Pirton, and I was amused to see a child's bicycle with a notice inviting anyone who wanted it to give it a good home. I stopped off at the pub in Pirton and had a quick drink, noting with bemusement the large chess board, complete with pieces, that was stuck upside-down to the ceiling. The path headed on past the motte and bailey of the old castle, no sign of which could be seen, before heading eastwards out of the village along a track that initially skirted some playing fields. It was a fairly boring stretch of walk, and it was almost a relief when the A600 road was reached, marking the entrance to Ickleford. What followed nest was a long and fairly boring walk as the Way headed through Letchworth, diverting off to run along a path beside the railway embankment towards the station before heading back towards the road and through an area of parkland called Norton Common. The next stretch of road walking passed through an industrialised area and included a surprisingly industrialised church, before the path diverted off to the right to cross a railway line and then the A1(M) on bridges. This marked the start of Baldock, and the feel of this smaller town was much nicer than that of Letchworth, with some older and prettier houses than those in Letchworth. It did not take me long to reach the railway station, and it was here that I had the first piece of good luck in the day - the train came in a few minutes after I had purchased my ticket at the machine, and this marked the start of the long trip back to Harlington. The walk meant that I had completed the entirety of the Icknield Way, and although that should have made me feel good, I could only feel relieved that what had been a annoying and undistinguished day's walk was over. 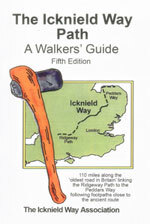 The exception to this is at the start of the walk, to reach the Icknield Way from Harlington station. Leave the station via the access road and then turn right along a road, immediately crossing a bridge over the railway line and climbing uphill eastwards. When the road ends at a T-junction in the village, turn right to start following another road southwards through the village. Just before the road leaves the village, turn right down a road called Park Leys. Turn left down a dead-end close, and then turn left along a footpath. This skirts some houses, crosses a plank bridge before emerging into a field. The footpath heads westwards towards the railway line, before turning to the left to follow the line southwards for a little under half a mile, passing through a band of trees called Harlington Spinney before reaching a bridge under the railway line on the right. Turn left here to join the Icknield Way. This makes a total distance of 21.9 miles, with 1693 feet of ascent and 1792 feet of descent. To get back to Harlington I had to get the train into Kings Cross, walk to Kings Cross Thameslink station, and then get a Thameslink train to Harlington.